Jesson Mata, director of the Office of Divine Worship for the Archdiocese of Portland, models a head bow, profound bow and genuflection. “Papa, why are you looking down at me?” she asked. “Because Jesus became man, Marian,” I said. Leave it to a 2-year-old to question the whys of sacramentals during the sacrifice of Mass. Why do we genuflect and bow at Mass, and when are the right times to do each? “Catholics are a sacramental people. We not only profess our faith through our words, but also through our actions,” says Jesson Mata, director of the Office of Divine Worship for the Archdiocese of Portland. There are many physical gestures in the Mass, says Mata, but because of their repetition, we often don’t stop to think what they mean. “For Catholics, gestures made with the body constitute an acknowledgement of God’s presence. We genuflect as a sign of adoration and belief in the Real Presence, that is, of Jesus Christ in the Eucharist,” said Mata. According to the General Instruction of the Roman Missal (GIRM 275), a bow signifies reverence and honor shown to the persons themselves or to the signs that represent them. There are two kinds of bows: a bow of the head and a bow of the body. A bow of the body, that is to say a profound bow, is made to the altar; during the prayers Munda cor meum (Almighty God, cleanse my heart) and In spiritu humilitatis (Lord God, we ask you to receive); in the Creed at the words Et incarnatus est (by the power of the Holy Spirit . . . and became man); in the Roman Canon at the words Supplices te rogamus (Almighty God, we pray that your angel). The same kind of bow is made by the deacon when he asks for a blessing before the proclamation of the Gospel. In addition, the priest bows slightly as he speaks the words of the Lord at the consecration. 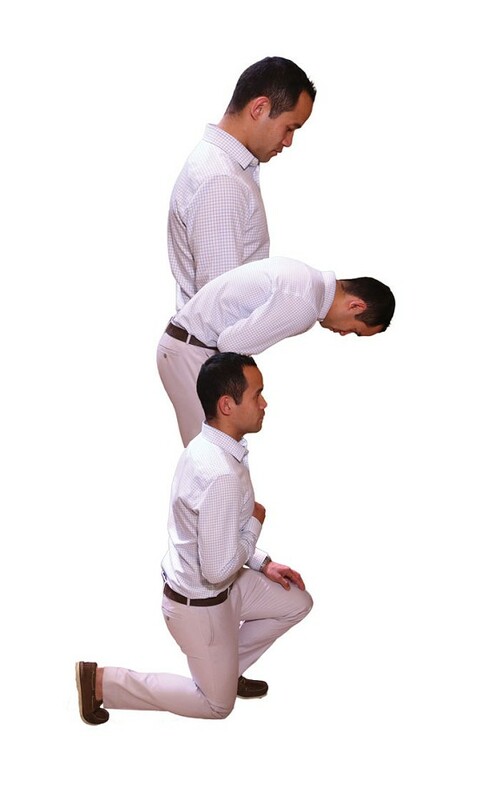 A genuflection is made by bending the right knee to the ground. It signifies adoration and is reserved for the Most Blessed Sacrament as well as for the Holy Cross from the solemn adoration during the liturgical celebration on Good Friday until the beginning of the Easter Vigil. During Mass, three genuflections are made by the priest celebrant: namely, after the showing of the host, after the showing of the chalice, and before Communion. Certain specific features to be observed in a concelebrated Mass are noted in their proper place (cf. nos. 210-251). If, however, the tabernacle with the Most Blessed Sacrament is present in the sanctuary, the priest, the deacon, and the other ministers genuflect when they approach the altar and when they depart from it, but not during the celebration of Mass itself. It is also customary for parishioners to genuflect before and after Mass when entering or exiting the pew, toward the tabernacle, acknowledging the presence of Christ in the Most Blessed Sacrament. The central issue concerning genuflection or bowing is simply this — showing respect both to the altar symbolizing Christ, and to the reserved Sacrament in the tabernacle. “When we genuflect or bow we are literally saying, ‘I believe’ without uttering a word. How awesome is that?” said Mata. In my church we are debating if we have to bow at the middle of the altar or at the side of the ambo before going up for the readings, . In my previous parish, during one of our Lectors' workshop we were told that we don't need to bow - Only Bow at the start and end of mass. Help! This comment has been hidden due to low approval.